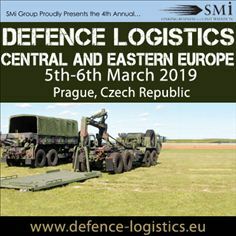 The US Armed Forces are confirmed to present at SMi’s 4th annual Defence Logistics Central and Eastern Europe conference, taking place in Prague, Czech Republic on the 5th and 6th March 2019. The 2019 conference will bring together the key military logisticians from across the Central and Eastern European region and beyond, to discuss new trends and crucial developments in the field of Defence Logistics and to discuss how modern Armed Forces can increasingly pursue improved logistical efficiency. Rear Admiral John Palmer, Commander Land and Maritime, Defense Logistics Agency, US DoD will present: Examining the Role of the Defence Logistics Agency (DLA) as a Key Organisation in the Provision of Logistics Support Both Worldwide and on a Regional Basis. His presentation will cover: Proactively integrating the DLA’s Global Readiness Solutions to ensure optimal EUCOM, AFRICOM and Service Component Warfighter Capability; Leveraging cohesion with the Joint Logistics Enterprise and promoting inter-agency capabilities and industry partnerships between allied nations; and Assessing the 2018-2026 Strategic Plan as a means of supporting US DoD priorities in building force capability and supporting allied forces. Brigadier General Frederick Maiocco, Deputy Commanding General, 21st Theater Sustainment Command, CG, 7th Mission Support Command, US Army will present: Setting the Theatre / Military Mobility. His presentation will cover: Ensuring supplies reach units spread on remote missions stretching from the Baltics to South Eastern Europe in a time of war; Successful implantation of training operations for Allied Nations across NATO’s Eastern flank; and How the 21st TSC logisticians are chartering the geographic terrain of the Baltics and Poland to better the Army’s understanding of possible logjams that can slow the movement of troops in a crisis. Colonel Robert ‘Joe’ Dixon, Deputy Chief of Staff, G4 Logistics, US Army Europe will present: Assessing the Logistical Operations of the US Army within Europe and Evaluating Strategies to Enhance Interoperability with Allied Forces. His presentation will cover Operating across international borders to ensure the security of supply chains; Working with host nation support during operations; and Encouraging compliance with allies to realise the full potential of USAREUR’s logistical command in theatre. The conference is proudly sponsored by: Ecolog, HIAB, International SOS, KH Inc, WEW and World Fuel Services.